Turned out that the reporter from the local newspaper visiting my lecture on Elvis' religious music succeeded in getting a picture with me and Elvis together, after all. 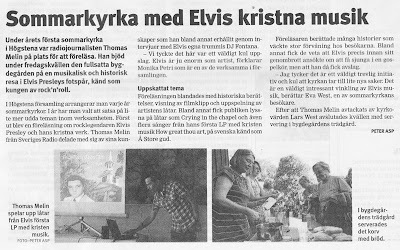 Not only that, the picture was also published together with the above article called "Summer church with Elvis' Christian music." All in all it's a nice read, although the reporter didn't pay attention when I told the audience that How Great Thou Art was Elvis' second religious album, not the first as he mistakenly wrote. He also told his readers that Elvis wanted to sing in a gospel choir instead of a gospel quartet. But I guess he can be forgiven. Especially as he wrote stuff like "the lecturer told many stories that caused astonishment among the attenders." And it's certainly not everyday I get my picture in the paper, and together with Elvis as well!